Dr. Bob Buehler is a long-time member of St. Augustine’s. He’s a scientist with a quirky sense of humor, which keeps us all laughing (well, most of us!) – and he is a Seeker of the Faith. He’s also a writer willing to detail his experiences with the Lord. Denny’s Daffodils “For those whose sacrifice is hidden in the heart of God, those whose “small” choices shift the balance of the world.”From Elijah in Jerusalemby Michael O’Brien I walked by Denny’s Daffodils every morning during sap collection season on my way to the first maple tree that I tapped. These daffodils marked the placement of my brother’s ashes for nearly forty years. Beth kindly recovered and replanted the bulbs right outside my window on the edge of the wood just behind our home. The leaves poked through the soil just a few weeks after I tapped the first maples of this winter season. 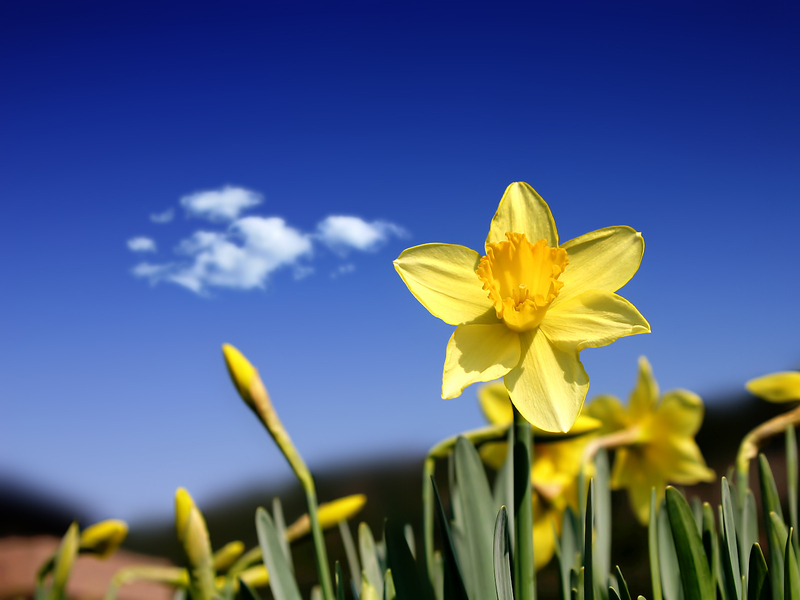 The daffodils serve as a wonderful reminder of my brother, my father, and my mother. Dad planted the bulbs oh-so-many years ago to add some brightness and beauty to a place in the earth that held so much of our family’s sadness. After Dad died, our family worked together, as we always do in times of sadness, to recover my brother’s ashes. All four branches of Mom and Dad’s family tree helped figure out the exact spot where Denny’s ashes lay. Mom and Dad decided to place the ashes under Denny’s favorite oak in the backyard, the same tree whose branches held our rope swing, supported multiple tree forts, and provided shade to the family picnic table. With Dad’s passing and the impending sale of our childhood home, we needed to recover them from under the oak and hopefully find a more permanent resting place. Several months ago, I was on my knees removing Denny’s ashes just as my father was on his knees 38 years prior, carefully and lovingly placing them in this spot with an anguish unique to a parent who loses a child (2 Samuel 18:33). Until then, I had never thought about what a terrible, lonely moment that must have been to place the physical remains of his eldest son into the earth. The quiet grace of this act still reverberates into the soul of our family. In my childhood home, you could see these daffodils from the chair where my father sat in the family room and from the kitchen window where Mom spent so much of her time. No doubt, these simple flowers provided comfort to them while also reminding them of the sadness of their loss. Mom spent her life giving. She gave gifts and hugs and food and love. To everyone. Yet one of her greatest gifts, one of her children, was taken from her. So, she responded the way those of us who knew her expected. She gave more. She gave all. My Aunt Jean tells a beautiful story that captures the essence of my mother as well as anything could. Mom and her three sisters were alone in their house in what could have been just another sad and scary night in their childhood ravaged by alcohol abuse. Mom must have been about 11 years old with her sisters Donna, Eleanor, and Jean ranging in age from 9 to 5. They had experienced another rough evening as Grandpa battled his demons and the four young girls were left alone in a ramshackle house with little to eat. Mom lit a few candles, turned off the lights, and set a table for the four young girls. She carefully cut an orange into four slices (no doubt sprinkled with some sugar) and served a small feast spreading light and love across the generations. Seven decades later, Aunt Jean still speaks lovingly and wondrously of this evening. In one of the most beautiful moments in the Gospels, Jesus “looked up and saw the rich putting their gifts in the treasury, and He saw also a certain poor widow putting in two coins. So He said “Truly I say to you that this poor widow has put in more than all; for all these out of their abundance have put in offerings for God, but she out of her poverty put in all the livelihood she had.” (Luke 21: 1-4) I read about four or five different translations of this passage. I was looking to see if there was ever an “as if” statement from Jesus in any version i.e. “It was AS IF the widow was giving more.” There wasn’t. No ‘as if’ in five versions. But, I wonder if this is how we are inclined to hear it? Or at least I am. All translations also open with some version of ‘Truly.’ That is because, the widow did give more in ways that our materialistic view of the world cannot see. This simple gift from a poor widow has impacted millions and millions of us for over two thousand years. We can still see her giving this gift. Her two coins changed the course of the universe. Just as your simple gifts and my simple gifts can. So, light some candles. Slice an orange (sprinkle it with powdered sugar), plant some bulbs, tap a maple, give your baby a bath, go to your child’s baseball game, take your wife to dinner, hug your father, send flowers to your mother, provide a meal to a hungry person, donate the clothes you no longer wear. Be Mary’s ‘Yes’ (Luke 1:38) to Eve’s ‘No’ (Gen 3:6) and forever change the course of the universe. –Dr. Bob B.